On Thursday, January 31st the Spring 2019 Distinguished Speaker Series kicked off with a phenomenal presentation by Jeffrey Resetco, Senior Director of Development with Greystar, formerly EdR Collegiate Housing. 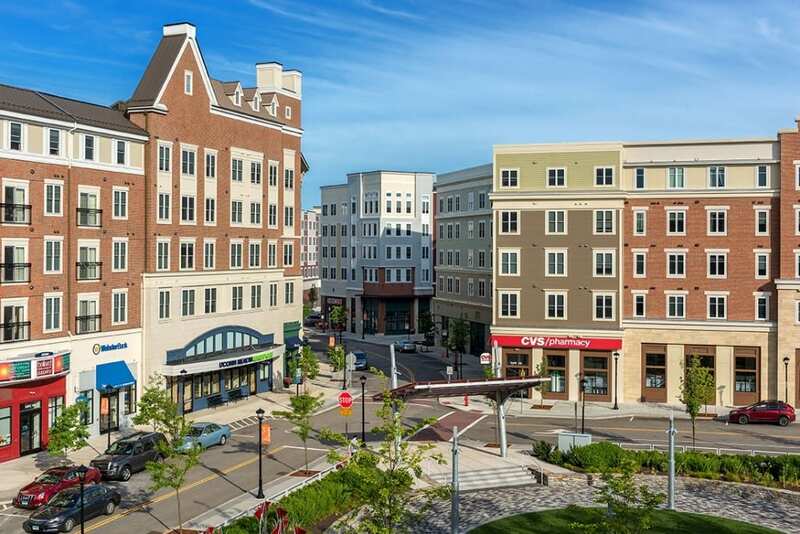 Prior to its merger with Greystar in September 2018, EdR was one of the largest student housing developers in the country. In his current role, Mr. Resetco oversees development and construction of off-campus housing. 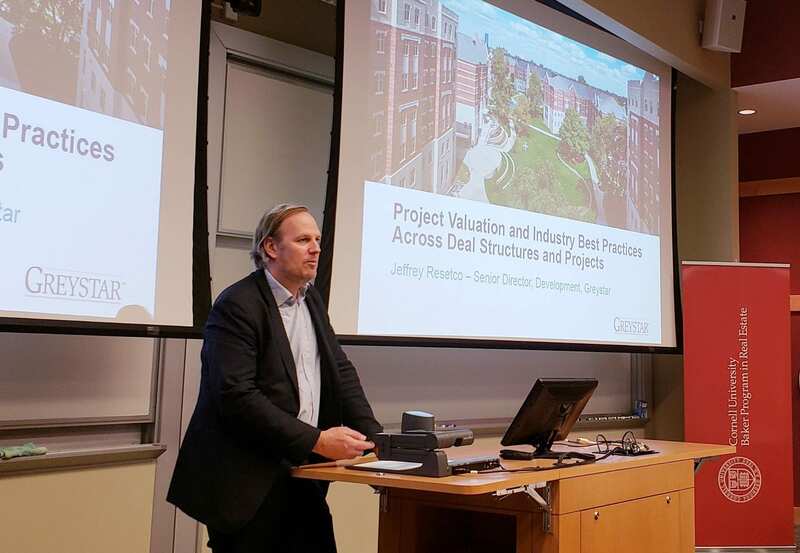 Some of his major projects include 929 units of “graduate student housing at Johns Hopkins Medical Institute, four phases of the mixed-use development The Oaks on the Square and Storrs Center at the University of Connecticut, and 605 West — graduate student housing at Duke University (EdR, 2019).” During his presentation Mr. Resetco shared insight into the student housing asset class and the important role that public private partnerships play in this line of work. He also highlighted some of his projects, including two with ties to Cornell. Third-Party Development Services – where Greystar assists a school with developing student housing and the school maintains ownership. On-Campus Partnerships – where Greystar works with a school to develop and manage a property on-campus. Such partnerships typically include a ground lease with the school. Baker students learned that these partnerships often involve a mixture of equity and debt financing. In these instances, ownership of the improvements is maintained by the equity partner and the school (as stipulated in the the equity partner’s operating agreement). In some instances, student housing projects are funded through tax-exempt bonds. In such cases, the property is owned by the 501(c)(3) that issues these bonds. Off-Campus Partnerships – where Greystar partners with a school to develop student housing in close proximity to campus. Mr. Resetco then walked students through an example proforma representative of a typical on-campus partnership deal structure. Jeremy Thomas, Senior Director of Real Estate for Cornell, also joined in the conversation and discussed some of the factors that influence a school’s decision to choose one development model over the next. The presentation concluded with a discussion of two projects close to home for Cornell students: Maplewood Apartments and the proposed East Hill Village development. Maplewood is a graduate student housing project developed by EdR between 2016 – 2018. The development is located on land owned by Cornell University. The complex replaced aged, low density graduate housing with 892 affordable, modern units. In total, the project cost approximately $85 million. Mr. Resetco shared with students about the vision for the development along with some of the challenges faced bringing the project to completion. Maplewood Apartments – Before & After Pictures, Photo Credit: TORTI GALLAS AND PARTNERS, INC.
Mr. Resetco went on to update students on the status of the East Hill Village project. East Hill Village is massive redevelopment effort underway to transform the East Hill Plaza area into a major gateway into Cornell campus. Students first learned of this project during Dan Zelson’s visit in April 2018. Greystar is part of the development team for this project and hopes to oversee residential development for the project including student housing, workforce housing and perhaps some inclusion of senior housing. Baker students look forward to hearing more exciting news about this project in the months to come. The Baker Program in Real Estate is thankful to Mr. Resetco for his visit and the insight that he shared with students. We wish him and the Greystar team continued success with Maplewood and the East Hill Village project.